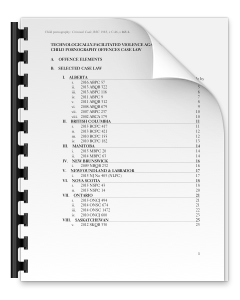 Here you will find all of the case law from the Cyberviolence Module in .PDF format, organized by Criminal Offence. TFVAW Luring a Child . TFVAW Making Sexual Material . TFVAW Mischief in Relation to Data . TFVAW Non-Consensual Distribution . TFVAW Sexual Assault . TFVAW Sexual Exploitation TFVAW Sexual Interference . TFVAW Sexual Exploitation of . TFVAW Voyeurism . TFVAW Unauthorized Use of a . a Person with a Disability Computer .